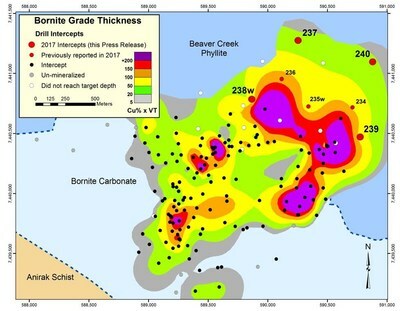 VANCOUVER, Dec. 4, 2017 /PRNewswire/ - Trilogy Metals Inc. (TSX, NYSE American: TMQ) ("Trilogy Metals" or the "Company") is pleased to announce additional results from this summer's exploration diamond drilling program at the Bornite Project, a part of the Company's Upper Kobuk Mineral Projects ("UKMP") located in the Ambler mining district of Northwest Alaska. The recently completed 2017 Bornite exploration program included a total of 9 drill holes comprising 8,437 meters. Note that due to inclement weather, two holes (RC17-241 and 242) were stopped before reaching target depth and cemented in preparation for re-entry during the 2018 drill program. The focus of this year's program was to target high-grade copper mineralization north and east of the previously identified resources and to define the edges of the mineralized system. Sample results from the first three holes comprising 3,083 meters of the then in-progress drill campaign were released on September 18, 2017 (https://Trilogy PR Sep 18 2017). The initial three drill holes showed thick and continuous intervals of copper mineralization and represented up to 300 meter off-sets from the Company's last round of drill holes completed in 2013, which shows that the Bornite mineralized system continues to significantly expand. Results from 4 further drill holes (RC17-237; 238w; 239; and 240), comprising 4,321 meters and representing 300 to 400 meter off-sets from the first three drilled holes, continue to show significant intervals of high-grade copper. 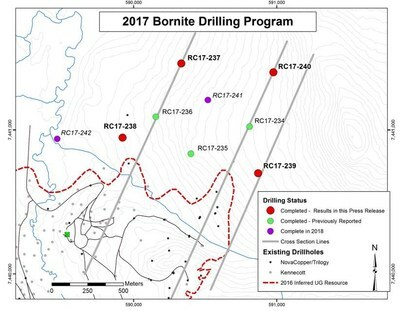 (See Figures 1 through 3 for cross sections of the Bornite Project drilling and Figure 4 for a map of the 2017 drill holes). This year's drilling is also showing strong northwest and northeast mineralization not previously recognized. (See Figure 5 - Grade Thickness Map). RC17-240 intersected one mineralized interval totaling 25.1 meters averaging 0.96% copper. Results are presented in Table 2 at a cutoff grade of 0.5% copper to be comparable with previous drill results released by the Company. Results at a more selective higher grade cutoff of 1.0% copper are also presented in Table 3 to show locally higher grade intervals. Rick Van Nieuwenhuyse, President and CEO of Trilogy Metals commented, "It was unfortunate that we could not complete two of the planned holes due to weather, but rest assured that we will complete these next year. The remaining four drill holes represent very large step outs from all previous drilling and demonstrate that the Bornite system continues to grow. We have essentially doubled the size of the mineralized footprint with an overall Bornite system now measuring 1500 meters by 2500 meters defined by a 50 Meter x % copper - that is 50 meters averaging at least 1% copper or better (see Figure 5). In particular, the grade x thickness map suggests NE and NW oriented controls on higher grade mineralization. Structural studies are ongoing with the voluminous amount of 3D structural data collected over the course of the summer drill program. This work will be focused on defining preferred mineralized corridors as defined by vein and breccia orientations to develop a sense of ore and grade controls. In addition, we continue to see significant cobalt occurring as carrolite and cobaltiferous pyrite. Electron microprobe and metallurgical work will be conducted during the winter months with the objective of determining if the cobalt can be concentrated into a saleable product. If it is determined that it can, then cobalt will be added to the resource base as a potentially valuable metal which could enhance the value of Bornite". Rick Van Nieuwenhuyse further commented, "We are in the process of planning the 2018 program with an estimated US$10 million budget. One component of the program will include a seismic program to be completed in the spring time when the ground is still frozen and the daylight has returned. The balance of the program will be directed at further in-fill and expansion drilling. The bornite-chalcocite-chalcopyrite minerals at the Bornite Project lend themselves well to forming a high-quality copper concentrate with no deleterious materials". Trilogy Metals has recently completed US$10 million exploration drill program at Bornite was funded by South32 Limited per the agreement announced on April 10, 2017 (https://Trilogy PR April 10 2017). The program was approved by a joint Trilogy-South32 Technical Committee and was focused on drilling the extensions of mineralization last drilled by the Company in 2013. South32 has until January 31, 2018 to elect to fund a second US$10 million program. 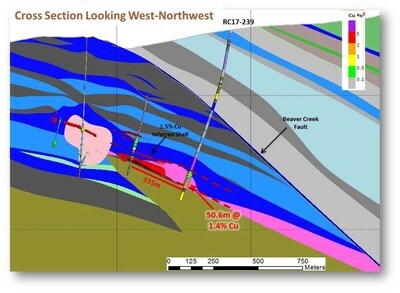 In April of 2016, the Company announced an updated resource estimate for the Bornite project of 5.5 Billion pounds of copper inferred resource at a grade of 2.26% Cu and 913 Million pounds of copper indicated resource at a grade of 1.02% Cu, based on the Company's previous three field seasons of exploration drilling and re-assaying of previously drilled core from Kennecott. 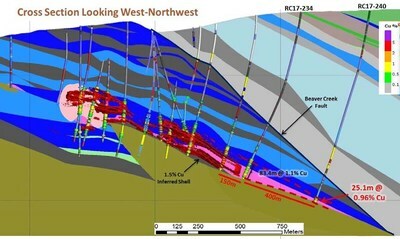 Additional information on the Bornite project can be found in the Company's technical report titled "Amended NI 43-101 Technical Report on the Bornite Project, Northwest Alaska, USA" with an effective date of April 19, 2016 and a release date of October 12, 2017 available under the Company's profile on SEDAR at www.sedar.com and EDGAR at www.sec.gov. The drill program, sampling protocol and data verification were managed by qualified persons employed by Trilogy Metals. The diamond drill holes were typically collared at HQ diameter drill core and reduced to NQ diameter during the drilling process. Samples were collected using a 0.2-meter minimum length, 2.5-meter maximum length and 1.7-meter average sample length. Drill core recovery averaged 88% overall and 91% within the prospective lithologies. The drill core was sawn, with half sent to ALS Minerals in Fairbanks for sample preparation and the sample pulps forwarded to ALS's North Vancouver facility for analysis. ALS Minerals in North Vancouver, B.C., Canada, is a facility certified as ISO 9001:2008 and accredited to ISO / IEC 17025:2005 from the Standards Council of Canada. Three quality control samples (one blank, one standard and one duplicate) were inserted into each batch of 20 samples. Results of the control samples were reviewed by the qualified person and were all within acceptable limits. Trilogy Metals will submit 5% of the assay intervals from prospective lithologies to an independent check assay lab. Trilogy Metals Inc. is a metals exploration company focused on exploring and developing the Ambler mining district located in northwestern Alaska. It is one of the richest and most- prospective known copper-dominant districts located in one of the safest geopolitical jurisdictions in the world. It hosts world-class polymetallic VMS deposits that contain copper, zinc, lead, gold and silver, and carbonate replacement deposits which have been found to host high grade copper mineralization. Exploration efforts have been focused on two deposits in the Ambler mining district - the Arctic VMS deposit and the Bornite carbonate replacement deposit. Both deposits are located within the Company's land package that spans approximately 143,000 hectares. The Company has an agreement with NANA Regional Corporation, Inc., a Regional Alaska Native Corporation that provides a framework for the exploration and potential development of the Ambler mining district in cooperation with local communities. Our vision is to develop the Ambler mining district into a premier North American copper producer. This press release includes certain "forward-looking information" and "forward-looking statements" (collectively "forward-looking statements") within the meaning of applicable Canadian and United States securities legislation including the United States Private Securities Litigation Reform Act of 1995. 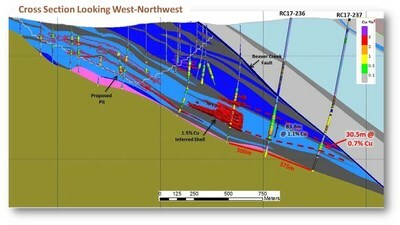 All statements, other than statements of historical fact, included herein, including, without limitation, the future operating or financial performance of the Company, interpretation of drill results, planned expenditures and the anticipated activity at the UKMP Projects, are forward-looking statements. Forward-looking statements are frequently, but not always, identified by words such as "expects", "anticipates", "believes", "intends", "estimates", "potential", "possible", and similar expressions, or statements that events, conditions, or results "will", "may", "could", or "should" occur or be achieved. These forward-looking statements may include statements regarding perceived merit of properties; exploration plans and budgets; mineral reserves and resource estimates; work programs; capital expenditures; timelines; strategic plans; market prices for precious and base metals; or other statements that are not statements of fact. Forward-looking statements involve various risks and uncertainties. There can be no assurance that such statements will prove to be accurate, and actual results and future events could differ materially from those anticipated in such statements. Important factors that could cause actual results to differ materially from the Company's expectations include the uncertainties involving the need for additional financing to explore and develop properties and availability of financing in the debt and capital markets; uncertainties involved in the interpretation of drilling results and geological tests and the estimation of reserves and resources; the need for cooperation of government agencies and native groups in the development and operation of properties as well as the construction of the access road; the need to obtain permits and governmental approvals; risks of construction and mining projects such as accidents, equipment breakdowns, bad weather, non-compliance with environmental and permit requirements, unanticipated variation in geological structures, metal grades or recovery rates; unexpected cost increases, which could include significant increases in estimated capital and operating costs; fluctuations in metal prices and currency exchange rates; and other risks and uncertainties disclosed in the Company's Annual Report on Form 10-K for the year ended November 30, 2016 filed with Canadian securities regulatory authorities and with the United States Securities and Exchange Commission and in other Company reports and documents filed with applicable securities regulatory authorities from time to time. The Company's forward-looking statements reflect the beliefs, opinions and projections on the date the statements are made. The Company assumes no obligation to update the forward-looking statements or beliefs, opinions, projections, or other factors, should they change, except as required by law. The Bornite Technical Report have been prepared in accordance with the requirements of the securities laws in effect in Canada, which differ from the requirements of U.S. securities laws. Unless otherwise indicated, all resource and reserve estimates included in this press release have been prepared in accordance with National Instrument 43-101 Standards of Disclosure for Mineral Projects ("NI 43-101") and the Canadian Institute of Mining, Metallurgy, and Petroleum Definition Standards on Mineral Resources and Mineral Reserves. NI 43-101 is a rule developed by the Canadian Securities Administrators which establishes standards for all public disclosure an issuer makes of scientific and technical information concerning mineral projects. Canadian standards, including NI 43-101, differ significantly from the requirements of the United States Securities and Exchange Commission ("SEC"), and resource and reserve information contained therein may not be comparable to similar information disclosed by U.S. companies. In particular, and without limiting the generality of the foregoing, the term "resource" does not equate to the term "reserves". Under U.S. standards, mineralization may not be classified as a "reserve" unless the determination has been made that the mineralization could be economically and legally produced or extracted at the time the reserve determination is made. The SEC's disclosure standards normally do not permit the inclusion of information concerning "measured mineral resources", "indicated mineral resources" or "inferred mineral resources" or other descriptions of the amount of mineralization in mineral deposits that do not constitute "reserves" by U.S. standards in documents filed with the SEC. Investors are cautioned not to assume that any part or all of mineral deposits in these categories will ever be converted into reserves. U.S. investors should also understand that "inferred mineral resources" have a great amount of uncertainty as to their existence and great uncertainty as to their economic and legal feasibility. Under Canadian rules, estimated "inferred mineral resources" may not form the basis of feasibility or pre-feasibility studies except in rare cases. Disclosure of "contained ounces" in a resource is permitted disclosure under Canadian regulations; however, the SEC normally only permits issuers to report mineralization that does not constitute "reserves" by SEC standards as in-place tonnage and grade without reference to unit measures. The requirements of NI 43-101 for identification of "reserves" are also not the same as those of the SEC, and reserves reported by the Company in compliance with NI 43-101 may not qualify as "reserves" under SEC standards. Accordingly, information concerning mineral deposits set forth in this press release or the Bornite Technical Report may not be comparable with information made public by companies that report in accordance with U.S. standards.